Sediment prefilters are designed to remove physical particles like dirt and sand from water. This is a must for wells. Our basic sediment filters should be replaced every three months regardless if it looks clean. Sediment filters do not remove chlorine or other chemical pollutants. You would need a carbon filter . 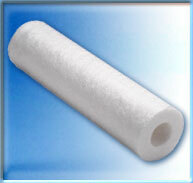 This filter is great for removing particles like sand and other particles that are larger than 5 microns. It is a true graded density pure polypropylene depth filter. Fits the standard 10" housing units. Filter dimensions: Height 9.78" Diameter 2.75"
This is a reusable filter. Simply wash it off and pop it back into the housing unit. It is emoving particles like sand and other particles that are larger than 5 microns. Fits the standard 10" housing units. Filter dimensions: Height 9.78" Diameter 2.75"